Heart- The organ inside your chest that sends blood round your body. The human heart is an organ that pumps blood throughout the body via the circulatory system. Study of heart is called Cardiology hart is dark red colored highly muscular central pumping organ. Location:- Heart lies in the thoracic cavity slightly towards left. Heart remain enclosed by protective covering called Pericardium. 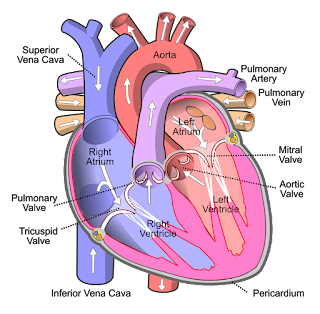 Pericardium is bilayered outer layer is called parietal Pericardium and inner layer is called visceral Pericardium. Between these two layer pericardial space is present which is filled with pericardial fluid. Pericardial fluid acts as lubricant and provides function less movement . It acts as cushion and also protects from external shock and injury. The average heart is the size of a fist in an adult. Your heart will beat about 115,000 times each day. An electrical system controls the rhythm of your heart. It’s called the cardiac conduction system. The heart can continue beating even when it’s disconnected from the body. If you were to stretch out your blood vessel system, it would extend over 60,000 miles. A woman’s heart beats slightly faster than a man’s. Size of heart is 12×8 cm. Weight of Heart is 300gm. Sino-Artrial node (S.A node) is called Pacemaker of the heart. SA Node- It is present in right auricle and generate the electrical impulses which causes contraction of auricles. The volume of blood pumped out by Hath par cardiac cycle is called cardiac output cardiac output is 70ml/cardiac cycle.